Today, the Louisiana State Quarter Coin remembers when La Salle proclaimed the territory of Louisiana for France on April 9, 1682. Territory of Louisiana, 1682-1762 (Map No. 1). The greater colored area shown upon this map is based upon the discoveries of La Salle and his proclamation made at the mouth of the Mississippi River on April 9, 1682. This proclamation was made in the presence of the entire party, under arms, who chanted the Te Deum, the Exaudiat, and the Domine salvum fac Regem. In the name of the most high, mighty, invincible, and victorious prince, Louis the Great, by the grace of God, King of France and of Navarre, fourteenth of that name, this ninth day of April, one thousand six hundred and eighty-two, I, in virtue of the commission of His Majesty which I hold in my hand, and which may be seen by all whom it may concern, have taken, and do now take, in the name of His Majesty and of his successors to the crown, possession of this country of Louisiana, the seas, harbors, ports, bays, adjacent straits, and all the nations, people, provinces, cities, towns, villages, mines, minerals, fisheries, streams, and rivers comprised in the extent of said Louisiana, from the mouth of the great river St. Louis on the eastern side, otherwise called Ohio, Aligin, Sipore, or Chukagona, and this with the consent of the Chaonanons, Chickachas, and other people dwelling therein, with whom we have made alliance, as also along the river Colbert, or Mississippi, and rivers which discharge themselves therein, from its source, beyond the country of the Kious or Nadoucessions, and this with their consent, and with the consent of the Motantes, Illinois, Mesiganeas, Natches, Koroas, which are the most considerable nations dwelling therein, with whom also we have made alliance, either by ourselves or by others in our behalf, as far as its mouth by the sea, or Gulf of Mexico, about the twenty-seventh degree of the elevation of the North Pole and also to the mouth of the river of Palms; upon the assurance which we have received from all these nations that we are the first Europeans who have descended or ascended the said river Colbert; hereby protesting against all who may in future undertake to invade any or all of these countries, people, or lands, above described, to the prejudice of the rights of His Majesty, acquired by the consent of the nations herein named. Of which, and all that can be needed, I hereby take to witness those who hear me and demand an act of the notary as required by law. Title to French territory in the Mississippi Valley and along the Gulf of Mexico was based upon this voyage and proclamation of La Salle. These acts of La Salle were, in fact, the foundation of French ownership, and have been so considered by all nations since 1682. The Louisiana thus claimed embraced two areas of contiguous territory—first, the territory drained by the Mississippi River, with all of its tributaries, and second, the territory between the Mississippi River and the River Palms. The wording of the proclamation is simple and direct, and its meaning seems incapable of distortion or of being misunderstood. It appears evident that La Salle had no information of territory beyond the source of the Mississippi River and its tributaries to the west, or, if he knew of such territory, he purposely excluded any claim to it for France. The western boundary of the original Louisiana is therefore traced along the summit of the watershed which defines the drainage basin of the Mississippi in that region, viz., around the headwaters both of the Red River and the Arkansas and their tributaries, and the Missouri River with all of its great tributaries from the west and southwest to the present northern United States boundary. In the effort made to locate the western boundary of La Salle’s Louisiana many untenable claims have been put forth by geographers. In one of those claims the province was carried far beyond the drainage basin of the Mississippi River; in fact, across the Rocky Mountains to the Pacific coast in the Northwest. In another, it is assumed that because France at one time claimed the Gulf coast to St. Bernard (now Matagorda) Bay, by reason of La Salle’s later discoveries, this territory should be added to the original Louisiana. A third, while rejecting the Pacific coast extension, selected the Rio Grande as the southwestern boundary, but, lacking in courage of conviction, published maps restricting the limits on the west by the Spanish-American compromise line of 1819. The great majority of geographers now reject the Pacific coast extension, but there remains a disposition to include the Rio Grande country. A careful study of available historical data reveals claims of France at one time extending only to the divide between the Colorado River and the Rio Grande at another time to the Rio Grande itself and with spiritual jurisdiction to the Pacific coast. In the negotiations with France for the purchase of Louisiana, Napoleon, Talleyrand, and Marbois admitted great obscurity as to boundaries and declared their inability to throw any light upon the subject. 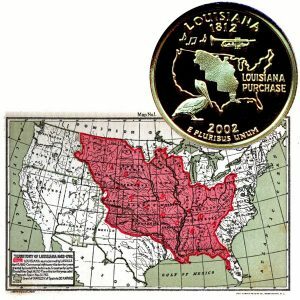 The Louisiana State Quarter Coin shows with an image of the colored map showing La Salle’s designation for the territory.